Sometimes a third is exactly what a pair needs. Stephen and Jack play a lot. These long-time lovers are constantly testing boundaries, fighting a delicious battle for control. When they meet young waiter Benji, they’re both intrigued. Such innocence doesn’t come along often and they decide Benji is the best thing on the menu. Benji feels like he’s in over his head with this sophisticated pair, but it might be Stephen’s musical and artistic temperament that makes three a crowd. Can Jack and Stephen hit just the right note? Or will Benji end up out in the cold? Publisher's Note: This book has previously been released elsewhere. It has been revised and re-edited for re-release with Pride Publishing. What are you waiting for? ...glass of ice water, a fan, and a private place to read... go! 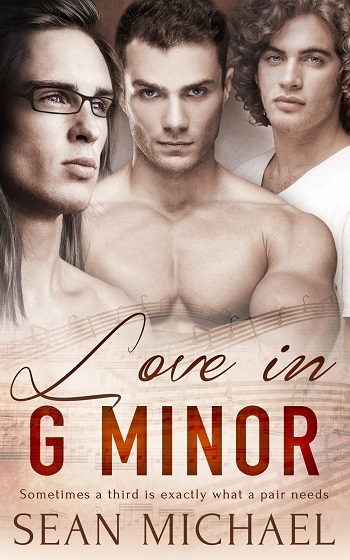 Reviewers on the Wicked Reads Review Team were provided a free copy of Love in G Minor by Sean Michael to read and review.